The AACD will continue its residency program in 2019 with nine new preceptors. Each resident will be learning from an AACD Accredited Member or Accredited Fellow. Hugh Flax, DDS, AAACD; Lynn Jones, DDS, AAACD; Mohan Bhuvaneswaran, MDS, AAACD; Thomas Trinkner, DDS, AAACD; Adamo Notarantonio, DDS, FAACD; David A. Schaefer, DDS, AAACD; Tara Hardin, DDS, AAACD; Prashant Hatkar, BDS, MDS, AAACD; and David Eshom, DDS, AAACD will each be instructing a dental resident and providing experience relating to all facets of an esthetic restorative dental practice including effective practice management, diagnostic tools, and restorative considerations. Residents will acquire the clinical and business experience needed to jump start a career in a cosmetic-oriented restorative dental practice by completing a series of requirements including studying dental literature and implementing simple to complex restorative cases. 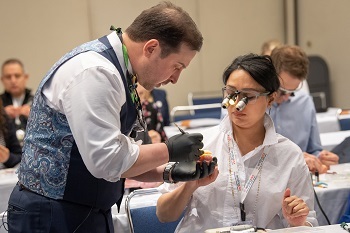 “The AACD Residency program is designed to expose young dentists to the clinical and business side of a fee-for-service style private practice,” explains preceptor Brian LeSage, DDS, FAACD. 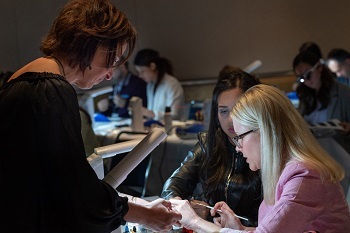 These dental professionals will have the unique opportunity to learn one-on-one from some of the most successful restorative dentists in the country and to observe, document, and execute a variety of cosmetic restorative solutions. In addition to gaining knowledge and experience relating to all facets of an esthetic restorative dental practice, these residents will gain the skills and confidence they need to enjoy the professional and financial successes that comes with a responsible, esthetic dental practice. The AACD is accepting and calling for 2019 Residency applications through November 30th, 2018. For more information about the AACD Residency pilot program, visit www.aacd.com/residency or email AACD Executive Office at residency@aacd.com.